Wednesday evening was a lovely spring evening; clear blue skies that attracted a large turnout for the start of the Dewars Series. 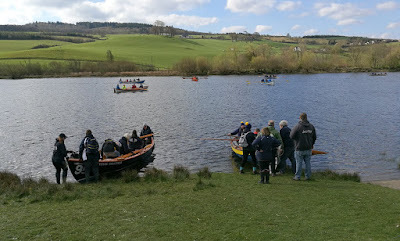 A total of nine boats took part in the two races. Conditions were very light and Bob Watson in his Laser (Blue Meanie) made an excellent start followed by Euan Macdonald in his RS Aero7 followed by John Ferguson crewed by Kieran Foley-Hall in the Albacore (Mirage). At the completion of lap one Bob (Blue Meanie) was still holding off, but only just, John & Kieran (Mirage) and Euan (RS Aero7). There was a long gap between the first three boats and the rest of the fleet led by the two Solos of Hunter Williamson (Woof) and James Curley (Bear). Leonie Poor in her Mirror (Emmental) had made a late start and was trailing the rest of the fleet. It was great to see Bill Inches helming his Albacore crewed by Audrey Roberson out on the water. Munro Gauld sailing the RS Quest single handed was managing to keep slightly ahead of his son Joe in the RS Feva. John & Kieran (Mirage) and Euan (RS Aero7) managed to overtake Bob (Blue Meanie) as they completed lap two. On lap three these three boats changed places frequently and it was Bob Watson who rounded the last mark to storm ahead of both his rivals to take the honours. The wind had increased for the second race of the evening and this time it was John & Kieran (Mirage) who got clear ahead at the start followed by Hunter (Whoof) and Bob (Blue Meanie) with Euan (RS Aero 7) fourth. At the back of the fleet there was an intense father and son battle between Munro (RS Quest ) Joe in the Feva. Audrey was helming Bill’s Albacore for the second race. At the line it was John & Kieran (Mirage) first followed by Euan (RS Aero7) and Hunter (Whoof). On Saturday morning in glorious weather, nine St Aylsa Skiffs set off for their annual rowing event to Wormit. It was an impressive sight as they headed out rowing against an increasing easterly wind, waved off by many in their support teams. On Sunday the first of the 2019 Heathens races was held. The easterly winds had increased in strength from the previous day and three boats braved the gusty conditions. Race officer Peter Bevan had set a long course using the navigation post on the South back as one of the four marks. Euan Macdonald (RS Aero7) got away ahead of James Curley in his Solo (Bear) and Andrew Porteous also in a Solo (Whooper). Andrew and James favoured the North Bank and Euan stuck to the South bank as they made their way to the windward marks. Andrew’s decision proved to be correct as he overhauled both of his competitors to cross the line at lap one almost a minute ahead at that stage of the race. Andrew (Whooper) continued to maintain his lead whilst Euan (RS Aero7) was becoming overpowered in the gathering wind and gusty conditions. The conditions eased slightly during lap three which allowed Euan to use some of the advantage of the faster RS boat to reduce Andrew’s lead. James (Bear) was also finding the conditions difficult and was losing ground as the race continued. On the fourth lap Euan (RS Aero) just managed to overtake Andrew (Whooper) and cross the line only ten seconds ahead of him with James about a minute and a half behind Andrew. Euan capsized to windward shortly after finishing but unfortunately this did not win him the Rubber Duck trophy (awarded to the first helm to capsize in the season) as he had capsized after the race had finished.